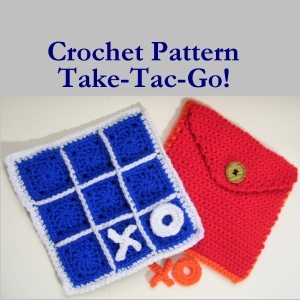 Crochet your own tic-tac-toe game! Perfect for keeping kids occupied on long summer days. (If you’re lucky, it might even buy you a little time to crochet in peace. :D) The storage pouch for the game pieces is built into the gameboard, so it’s easy to take along in the car or on picnics. Can be made of any yarn, though I’d recommend a sturdy acrylic for its strength and washability. Materials needed: Worsted weight yarn of your choice, in two or more colors. You’ll need approximately 3 ounces of the main/motif color and an ounce of your contrast color. For the Xs and Os, size H (5.0 mm) hook. For gameboard/carry pouch, size I (5.5 mm) hook. One button 1 to 1.25 inches (2.5 to 3.2 cm) in diameter, and appropriate thread and needle for sewing it on. Tapestry needle for weaving ends. Sale of finished items is permitted. Enjoyed making the spiral dishcloth and looking forward to making several of them and some of the square ones and the ruffly ones. Appreciate so much that you shared so many of your excellent designs. Thank you.